Himsel Army Airfield at Camp Atterbury Joint Maneuver Training Center, Ind. has seen a lot of air traffic over the years. Helicopters of various types, C-130 cargo aircraft, Marine Corps V-22 Osprey tilt-wing aircraft, even NATO member nation aircraft have graced the runway at Himsel. However, due to the restricted airspace around Camp Atterbury, civilian aviators had to give the installation a wide berth. That changed, at least temporarily, as over 20 civilian aircraft and one warbird landed at Himsel Army Airfield, Aug. 11, when Camp Atterbury hosted the first Warbird Salute to Soldiers Fly-in. 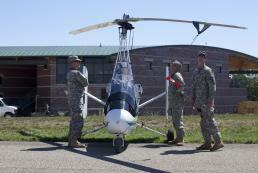 According to Maj. Dave Rader, aviation division chief at Camp Atterbury, the idea was to open up the airspace and allow civilian aviators the opportunity to fly in to Camp Atterbury. Rader said that there were prior permission requests for 21 aircraft including one warbird to land at Camp Atterbury. He said this event gives these pilots a glimpse of the activities occurring on the installation that they might otherwise be unaware of. Warbirds are vintage military aircraft maintained and flown by civilian aviators. According to Rader, they are a significant investment to maintain as spare parts are increasingly difficult to obtain and in some cases those replacement parts must be fabricated. Four warbirds were scheduled to land, but due to maintenance issues, only one landed at Camp Atterbury. It was a T-6G Texan flown by Larry Jacoby, of Noblesville, Ind. Jacoby said that nearly all American fighter pilots during World War II were trained using the T-6 and it was used to train Navy and Army Air Force aviators. Jacoby, who has been a pilot for 45 years and is now semi-retired from being a flight instructor, heard of the event from Lt. Col. David Ellis, director of the Soldier Readiness Center at Camp Atterbury.